The contents of the bags need not be handled until the wash and dry cycle is complete. Bags ensure the safe transport of instruments from user to disinfection and sterilization department. 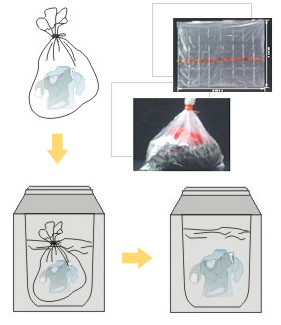 The bags dissolve completely in the wash, leaving no potentially infected plastic waste. Once instruments are sealed in the bags, the risk of contamination and cross infection is minimized. The bags will dissolve completely during the washing and disinfection process. All bags are anti-static, non-toxic, odor retentive, gas and solvent resistant and fully bio-degradable.